« Totally “Green” Kitchen & Where The Heck Have I Been? When I buy pieces, I don’t buy for any one particular room. Rather, I found what I think I will need eventually. That’s kind of the problem (or the benefit depending on how you look at it) of DIY home projects. 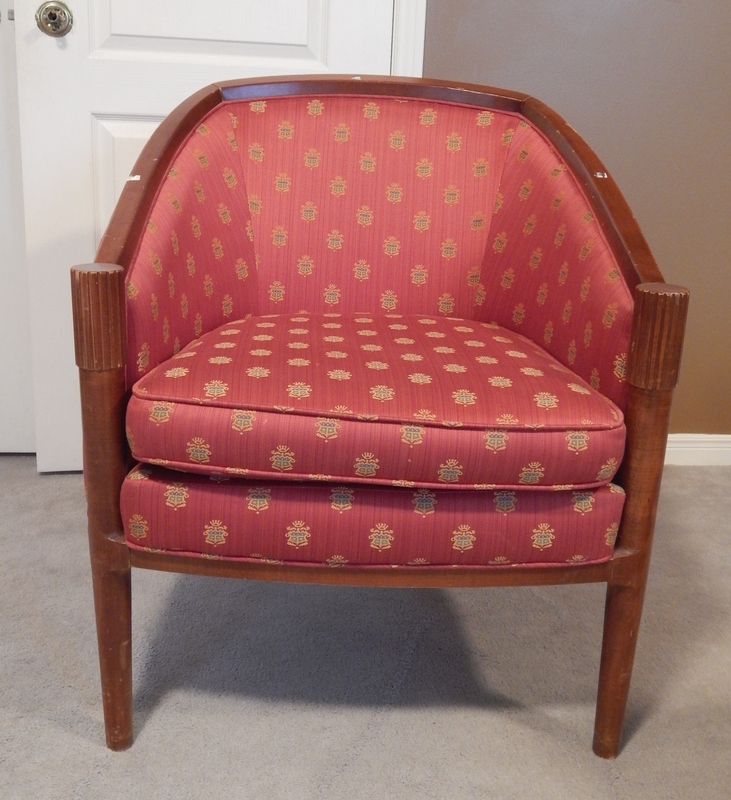 Most of you will know that I’m in the process of changing out almost every room of my house with thrifted, vintage or antique pieces so when I spotted a pair of tub chairs for $8 a piece, I knew I had to have them for my family room. This room is nowhere near being the way I want it yet, but with these 2 pieces now acquired, it’ll get there someday! I only photographed one of them but they are identical. I’ve got one done so far and I”m in the process of painting the second one now. 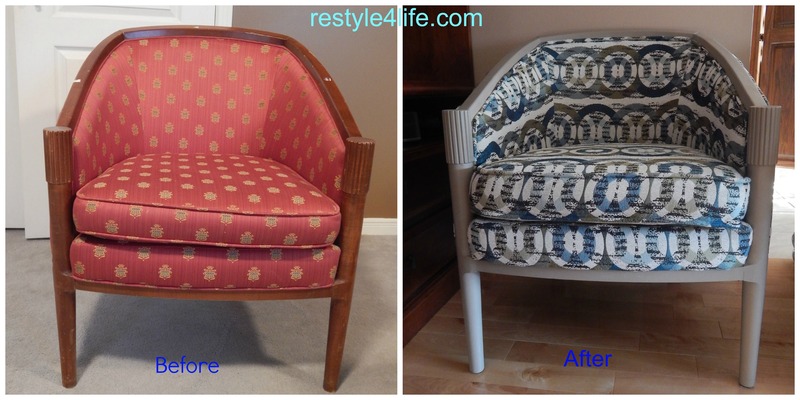 Hubby was fabulous while I was away on business last week and stripped all the upholstery off chair #2. What a welcome surprise for me! Here’s what it looked like when I got it. It reminds me of something you’d find in a hotel room but I thought these would do to replace a loveseat. We plan on making our own ottomans for both chairs. They are not the best wood and one of them was already partially covered in paint so I used Annie Sloan chalk paint in Coco. Got some fabulous chenille that was regular $40/metre for $15 on clearance and there was JUST enough. What luck! I forgot to calculate for pattern repeat. 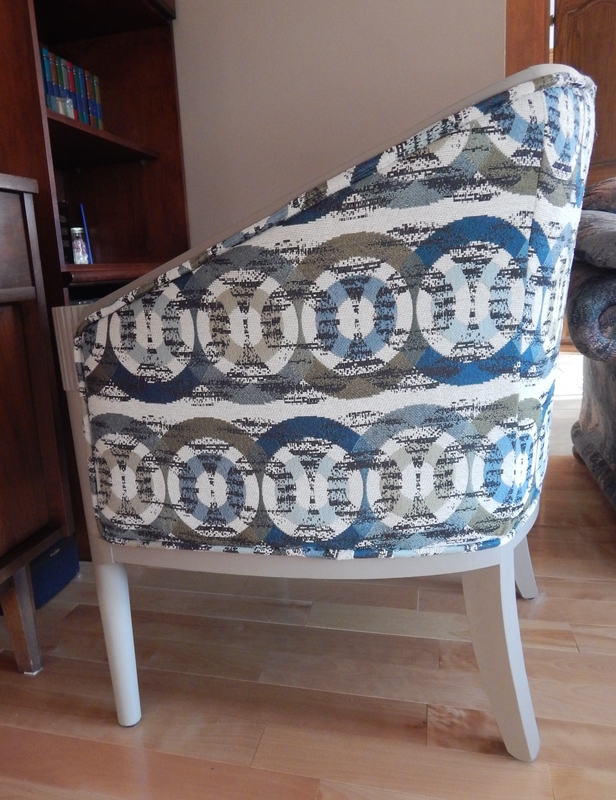 I knew I wouldn’t be able to match the pattern perfectly due to the chair’s curves but I’m happy with it like this. The cushion looks a little wonky right now. I wanted it to be snug. 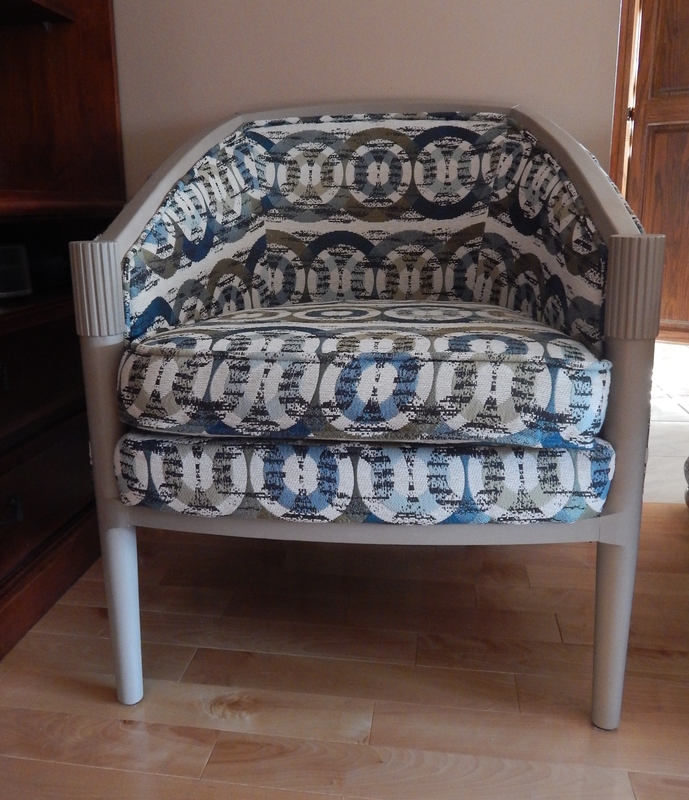 I learned my lesson from the sofa project I just finished a couple of weeks ago. I haven’t posted about that yet because it was a nightmare to do the box cushions and they’re not fitted enough. My solution will be to add my batting to really make them snug. On this chair, however, I had the opposite problem! I’ve got to take some batting out on this one but I’m so happy with it because I find box cushions incredibly challenging. Either that or I just don’t have the patience. Here’s the sofa with the cushion problem. 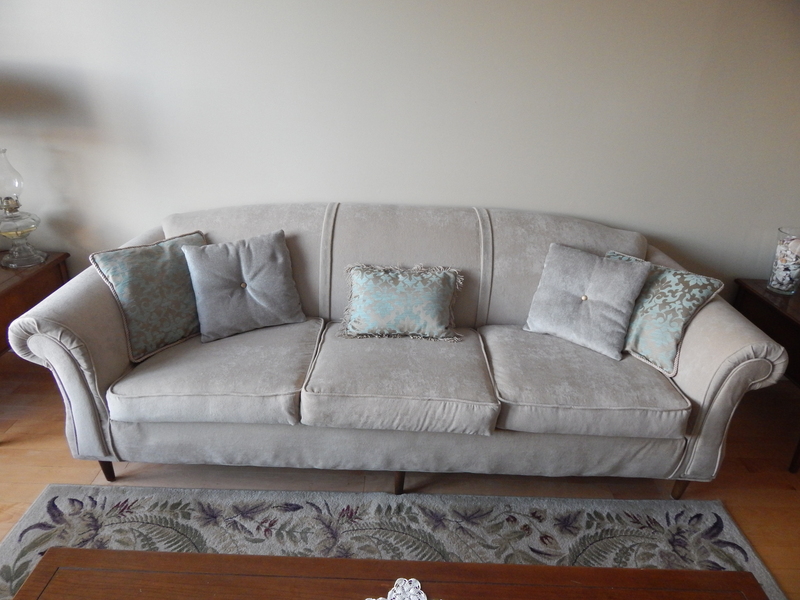 This sofa originally had bull nose cushions, not box. I had no pattern to work with and I’m terrible at measuring in inches. Absolutely terrible. I am a perfectionist though and I know I can completely make this work when I get around to it. This sofa is another story all together. Coming soon (hopefully). Here’s the chair all done. OMG did you really cover that tub chair all by yourself? What a skill to have, I am so very envious. Awesome effort and inspirational! As for cushions on sofas, like yours, I like big plumpy ones that squish down a bit, same shape but different colours/patterns. Off course odd numbers, and a bit scattered i.e. not perfectly symmetrically placed. Thank you soooo much! It’s really not that difficult to do. The hardest part has got to be removing all the old fabric and staples. 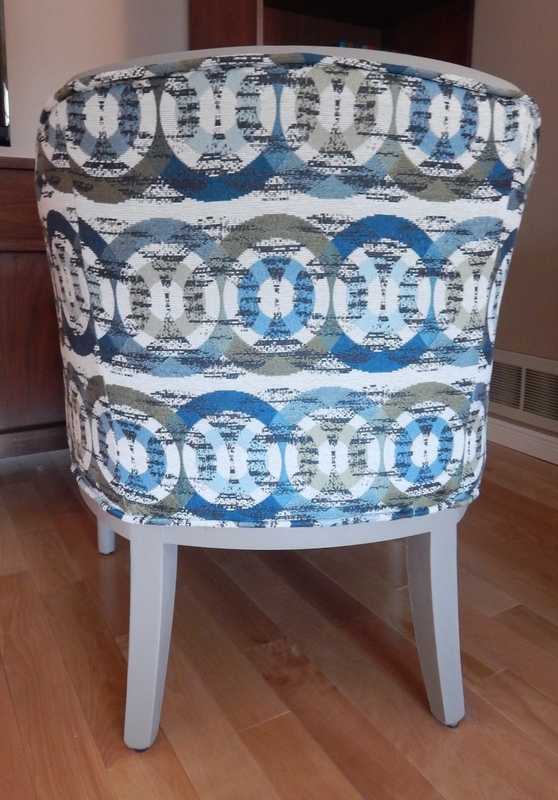 With some basic sewing skills and the ability to think a little bit outside the box, anyone can do this. It’s just really important to take lots of pictures as you go in order to know how to put it all back together.